After about 30yrs I thought it was about time I recovered my folding blind. Purchased a length of Jack Pike and wrapped it around but inside out as the inside is a nice muted misty greeny brown shade. used some bits of old camo over the top to break up the outline. Doesn't look too bad and hope the pigeons can't see it until too late. Try it out in the morning. I also upgraded my pull trolley for carting the bits and pieces to the blind. The blind when folded is as light as a feather and can be carry hanging on the shoulder. I am at the age now where if the 'camp' site is more than 150yrds then I look for an alternative. Need to now fit a T bar to help pull the trolley. The blind is just scrap metal and black water pipe. I wish I had a fiver for every corvid and pigeon that has been shot out of it, I would be a rich man. A very good renovation has taken place there and another 30 years worth of shooting in it. Very innovative use of items to hand in the manufacturing, l do like to see everyday items incorporated instead of the must have at any expense attitude that exists. Cracking job. Recycling at it's best. 👍 Good luck with the pigeons. It's obviously worked over the past thirty years and now it looks good for the next thirty, well done. Perhaps you could fit it all on the back of a BSA C15/ B 40 Scrambler to extend your range???? 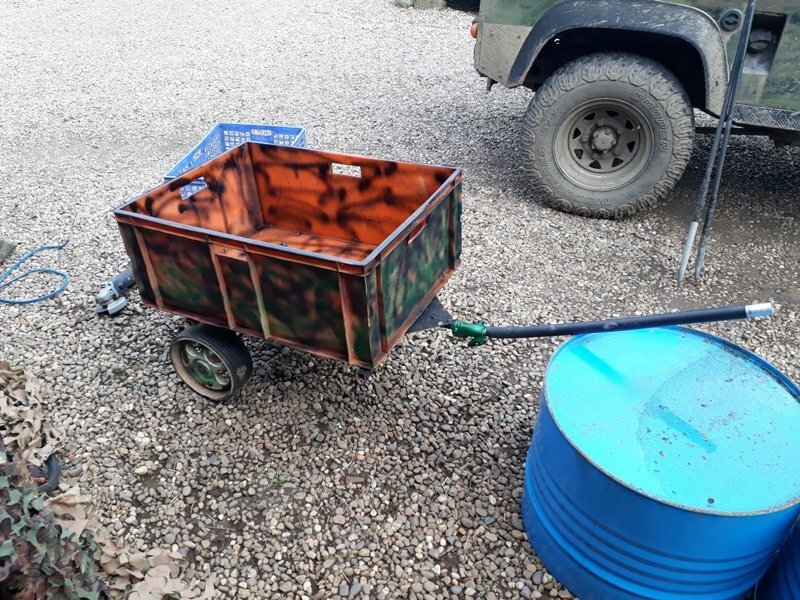 D I Y at it's best Walker , I love to see people use there innovative when it come's to pigeon shooting, and both the hide and the cart look the business , any labour saving device at our age certainly get the thumbs up . How do the pipes stay up in place ?. I really like the look of that . 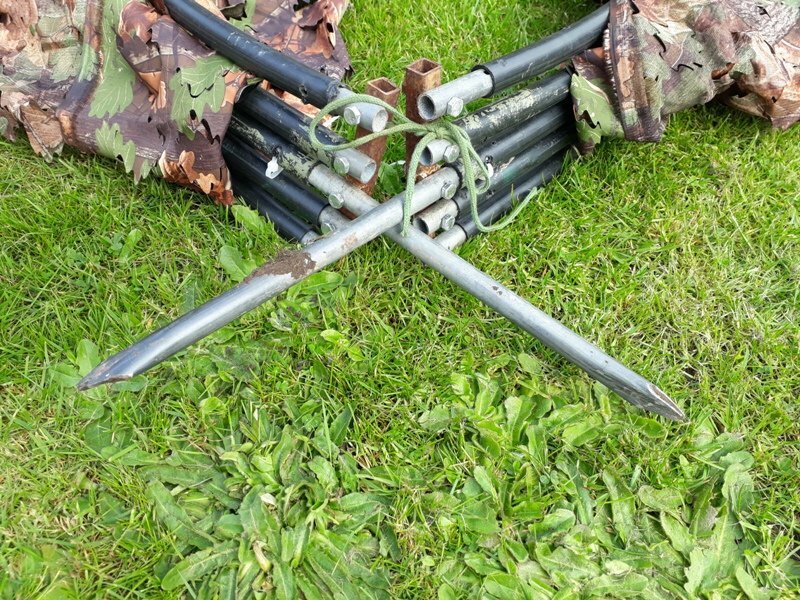 There are strainers, also made with watr pipe but with board clips attached either end so I can unfold it, clip in the strainers, one at the front, one either side of the shooting hole and two in the upper section. In a bit of wind I also drive in some steel retaining spikes, a couple front and back. Yes, on stubble, I just chuck a couple of big handfuls of straw on top and it looks like something the combine has regurgitated. Normally against a hedge I don't cover the rear entrance. 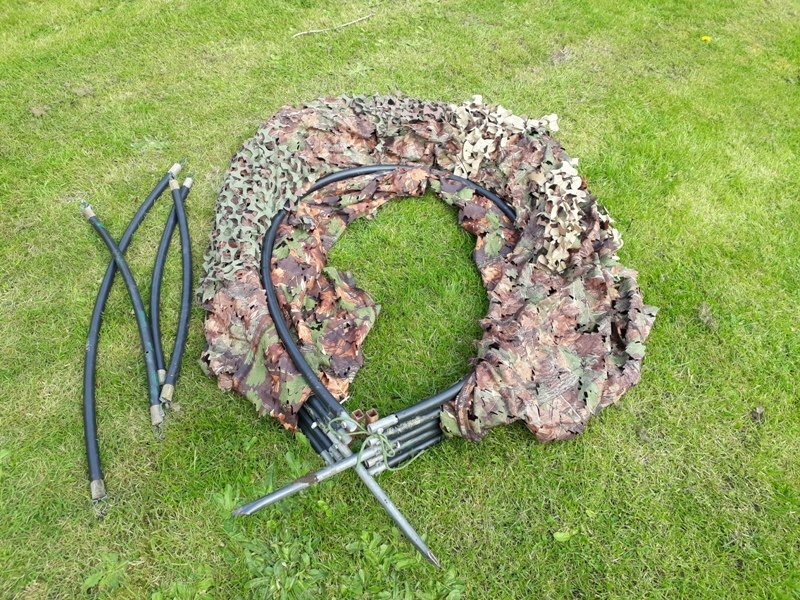 In a open field situation, easy to just tie a separate piece of camo across. One joy is if you pitch in the worng place then it folds very quikly and you can move and have it up in minutes, just needing to shift the gun, coffee and biscuits in that order. 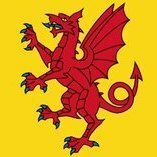 I have made a couple for friends and to my knowledge they are still using theirs having had them for the same length of time. By lengthening the pieces of pipe you can easily make it a two man blind. I used it for many years for ambushing deer but now have a Bush Wear pop up. 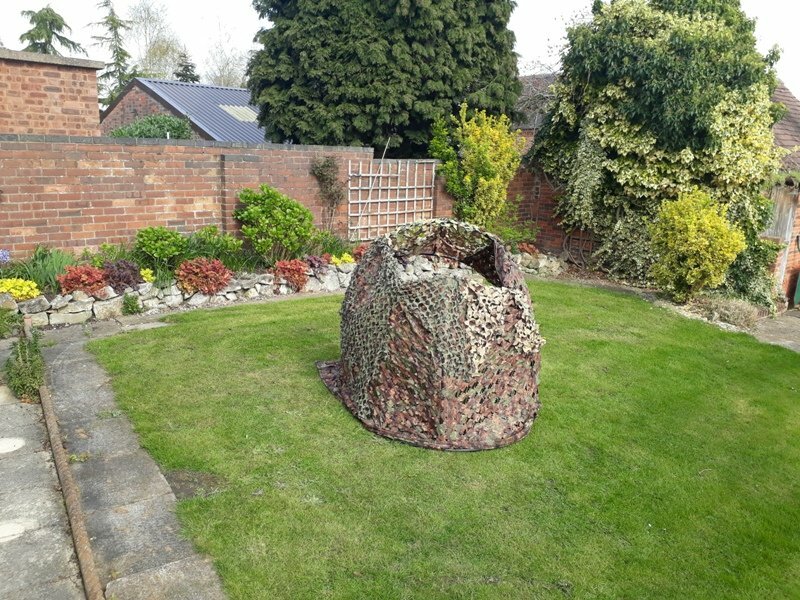 Is there any chance you can take a photo of your hide without the netting so we can see how it folds out or is constructed? Or is the camo permanently attached? Camo is permanently attached. I will have a go at drawing a diagram and putting it on later. OK, I hope this helps. Basically you need two identical pieces as shown in the diagram. Obviously the tubes need to be the same size to push a good fit in the black water pipe. You then cut five lengths of pipe to whatever size you need the blind to be the longer the pipe the wider the blind. about 8ft would make about the smallest. It is easier to sit on whatver seat you are likely to use and bend the pipe over your head and see where best suits you. Make up the two units using round tube for the pipe and a piece of square for the cross piece. The length to go in the ground wants to be about 9 to 12 inches. The bits that go into the pipe about 5 inches will do fine. The centre arch is fixed but by drilling and bolting the others (use lock nuts) they will then fold and open as required. I have made some lengths of tube as stretchers, put in bits of wood each end and a clip, so that the hoops can be fixed where I want them. You can however just join them with cord at the positions which suit you and the whole thing will stand on it's own once opened. I drill a series of holes around the hops so I can attach camo with small zip ties and the pipes at either end are zip tied through a hole onto the pipes to keep them in place. I intend welding a small two inch bit of tube sticking out from the centre peg so I can push it into the ground more easily ...I always have a piece of rod and a plastic mallet to knock in and make some holes if the ground is hard. Ina strong wind I also have some pegs....bend bits of thin rod to drive in and pin the whole thing down, but it has to be a good wind. 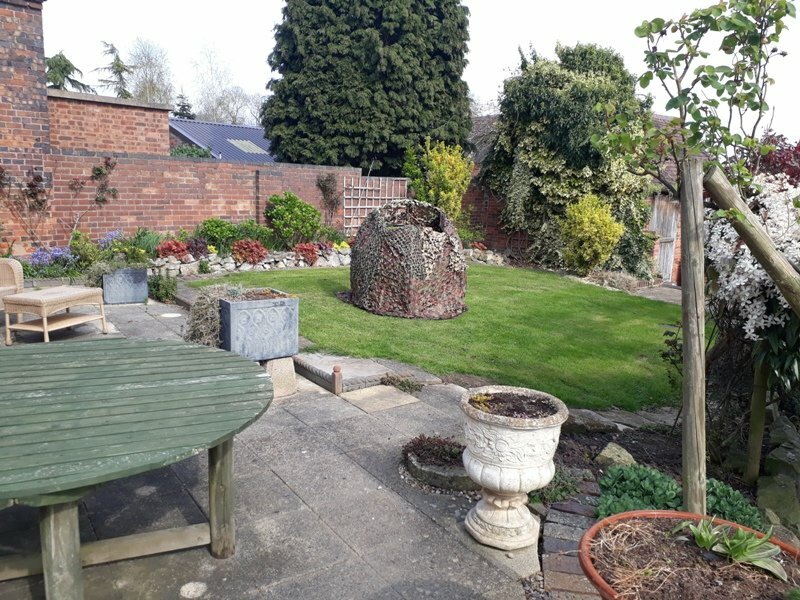 If the only plce to set up is against a hedge or fence then you can just lower the ront fully and partially lower the back sections against the hedge/fence and enter simply by lifting the front hoop. Hope this helps, as shor of you actually handling the thing it is not easy to explain.